I really love trying out and writing about up-to-date and innovative skin products. Today I’m going to tell you about my experience using the Teoxane RHA Serum, a high-quality, premium anti-aging serum. I knew very little about the cosmetic brand Laboratoires Teoxane before I tried out their Teoxane RHA Serum. I only knew that the company had been in existence since 2003 and therefore didn’t belong to the group of already long-established cosmetic producers. Since its foundation, Teoxane has specialized in the production of fillers for anti-wrinkle injections. A lot of beauty salons work with this manufacturer, which shows that Teoxane products hold to their rigorous medicinal standard of quality. The Teoxane beauty products are produced in Geneva – in my opinion that’s already a good sign. I can imagine that beauty products coming from Asia wouldn’t quite reach the high standards of production in Switzerland. 1 Claire-ity Skincare 25% Vitamin C Serum with Hyaluronic Acid and Vitamin E, Best Organic Anti-Aging... 767 Reviews $15.74 SHOP NOW! 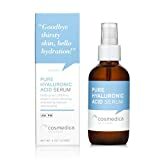 2 Cosmedica Hyaluronic Acid Serum for Skin – 4 Ounce Hydrating Facial Moisturizer with Anti-Aging... 3925 Reviews $23.95 SHOP NOW! 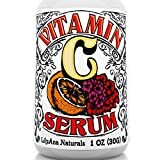 3 Vitamin C Serum with Hyaluronic Acid for Face and Eyes – Organic Skin Care with Natural... 103 Reviews $19.99 SHOP NOW! The Teoxane RHA Serum is a beauty care serum that assists in skin regeneration, or at least that’s what the manufacturer says. It is also said that after only 14 days, skin is already visibly revitalized. Two weeks doesn’t seem like much time at all and to me it seems a little bit too optimistic, but I’m going to go for it anyway. The Teoxane RHA Serum is definitely no bargain buy. You can’t just buy a small sample to try it, you have to go all in and get the big bottle. That’s what I then did and ordered the 30ml bottle online. The Teoxane Serum has a gel-like, transparent consistency and the container is fitted with a pump dispenser. This makes it easier to squeeze out the right amount as well as prolonging the shelf life of the serum which is already very lengthy. I applied the Teoxane RHA Serum every day, once in the morning and once in the evening as well as continuing my normal skin routine. Although I didn’t see a substantial difference in skin complexion after two weeks, after another four weeks I could start to see changes. After a total of six weeks using the Teoxane RHA Serum, my complexion was visibly clearer and fresher. My complexion is now more even, smoother and fine lines have been plumped up. This positive effect is probably due to the hyaluronic acid Teosyal, being one of the main ingredients in the Teoxane Serum. It uses natural substances to increase the moisture content of the skin. In addition to that, it lightly plumps up the skin from underneath. I have to say that my experience using the Teoxane RHA Serum was limited to only six weeks of regular application. Nevertheless, I can still say that this beauty care serum works well. The effects aren’t as immediate as the producer suggests (just two weeks). With a little more patience, you will see visible differences. The manufacturer recommends also using a facial cleanser that contains a mild hyaluronic acid solution (RHA Prime Solution). It shall help to further moisturize the skin. I might try that out in the winter when my skin needs a moisturizer more than in the summer because of the cold, dry air. Do you have some experience with Teoxane RHA Serum?